When peaches are in season, this really simple and tasty dish is served in my home again and again—for breakfast or dinner. Sweet and juicy, summer peaches are one of my favorite seasonal fruits. From cobblers and pies to smoothies and ice cream, fresh peaches are a delicious addition to almost any recipe. Buckwheat, slowly cooked in milk with peaches and coconut oil until it becomes creamy and tender—while adding cinnamon, vanilla and a hint of sweetness—makes this dish a summer favorite. 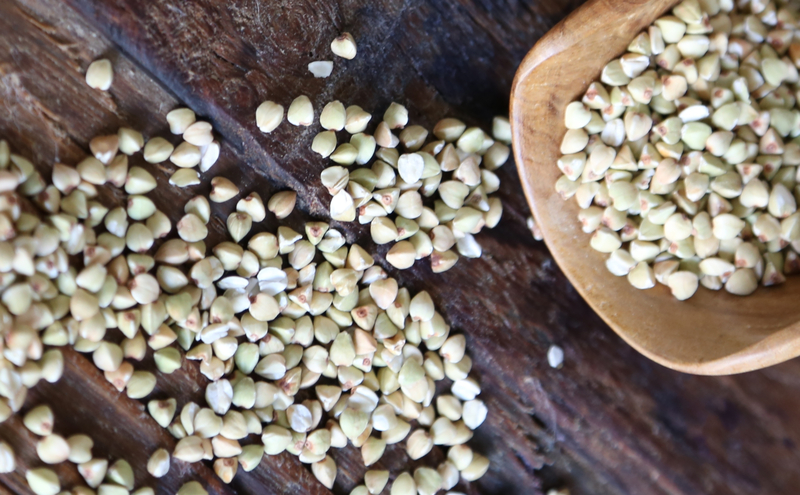 Made with plant milk and buckwheat, this recipe is both vegan and gluten free. If you prefer, you can use cow’s milk instead, and if you can’t find buckwheat groats, feel free to use rice. Heat coconut oil in a saucepan over medium heat. Add peaches and cook until some juices have been released, about 5 minutes. Add buckwheat groats and stir until well coated. Add plant and coconut milks, cinnamon stick, and vanilla. Bring to a boil, lower the heat, cover and simmer until buckwheat is tender and most of the liquid has been absorbed, about 25 minutes. Add more milk if it becomes too thick. Discard the cinnamon stick, and mix in salt and sweetener (if using). Top with chunks or slices of fresh peaches, or peaches sautéed in coconut oil. Add 1-2 other of your favorite toppings. Serve warm or cold. Sounds delicious, will try it this weekend. Can I use ground cinnamon instead of the stick? Hi Mandy, sure, ground cinnamon is fine. I would try 1/2 teaspoon first. You can always add more later if you want. I hope you (and Rio) like it! I sometimes add ground walnuts and/or diced avocado (for added nutrition) for the little mouth at home. He LOVES peaches and LOVES this!! I very much enjoy fresh, lush peaches right now over my rolled oats for breakfast. I’m intrigued by your buckwheat porridge and think it is probably something I would really enjoy in the mornings to give myself a break from rolled oats. We used to have a lot of rice porridge growing up, but since I don’t eat much rice anymore, porridge hasn’t been on my radar. Until now, that is. 🙂 Buckwheat groats is now going on my shopping list! Hi Ngan, we often eat oatmeal for breakfast too. The buckwheat is a nice change from time to time. Also, to make our morning oatmeal more interesting, we often add chia, flax, sunflower or pumpkin seeds; a variety of fresh berries or other fruits; nuts (often almonds or walnuts); raisins or dates; or even avocado! Yes, I love to experiment with even my oatmeal. It provides such a great base for a variety of added flavors. I hope you found buckwheat groats when you went shopping! Thanks for stopping by. And all the best to you and your adventures in your kitchen! WOW! This hot cereal is amazing. Well, I actually had to use Oat Groats instead of buckwheat (will try buckwheat next). I used very ripe peaches and the cereal came out very sweet, didn’t need to add additional sweetener. My whole house loved it. Thx for the post! I’ll be making this frequently with grain and nut milk variations. Nice to make a double batch to have for the whole week! 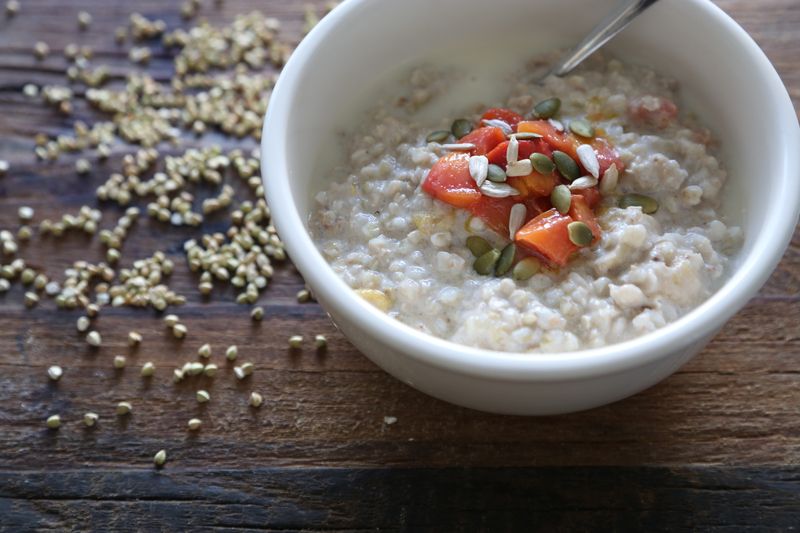 Oat groats are a great substitution! So glad you liked this porridge. I don’t feel the need to add sugar either. 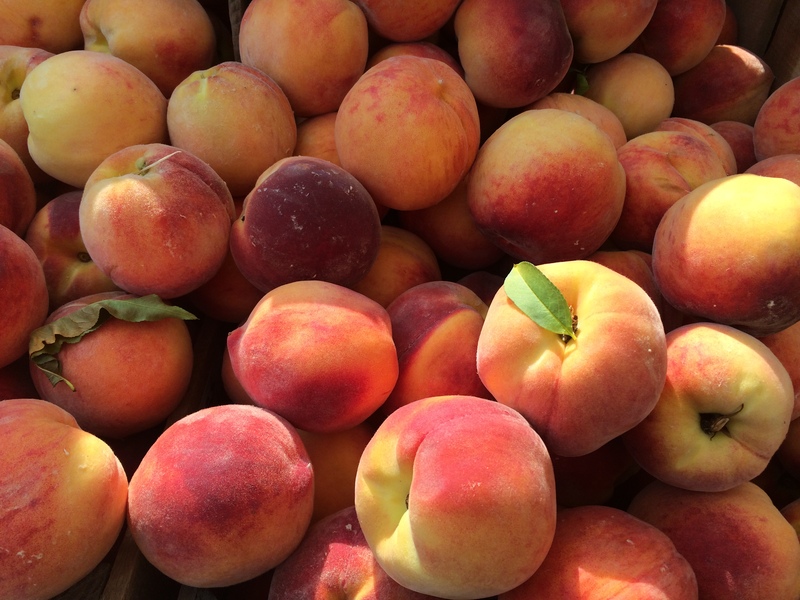 If your peaches are ripe, they add plenty of natural sweetness! Let me know if you come up with any great grain and nut milk variations. We often use oat or hemp milk, but I’m sure there are others that would work as well too. And the grains, perhaps quinoa or Canahua (I wrote a post on it)! Good luck and have fun exploring!